MHT CET 2019: The last date to fill and submit the MHT CET 2019 Application Form is tomorrow (31st March 2019). Applicants will not be allowed to apply after this given deadline. The MHT CET exam dates have been announced and MHT CET 2019 Application has been released on 1 January 2019. The First thing you should know about MHT CET 2019 is that the Directorate of Technical Education (DTE) Maharashtra conducts Maharashtra Common Entrance Test every year. The last date to submit the application form is 31 March 2019. The MHT CET exam will be conducted from 2nd to 13th May 2019. MHT CET 2019 Admit Card will be published on the official website at the end of April 2019. Did you know that MHT CET 2019 is also known as MHCET? It is a state level examination conducted every year by the government of Maharashtra. The MHCET 2019 entrance test is held for admissions in Engineering, Agricultural Science, & Pharmacology subjects. This year MH CET 2019 is proposed to be conducted 2nd to 13th May 2019. On an average, about 2 lakhs candidates apply for the examination. Candidates will be able to fill MHT CET 2019 Application Form till 31st March 2019 as it will be closing tomorrow. Click on the link to apply now. MHT CET 2019 Application Form has been released on the official website: mhtcet2019.mahaonline.gov.in. MH CET 2019 Exam Dates have been released. The examination will be conducted on 2nd to 13th May 2019 in the online mode. Check other dates from the table given below. The mode of MAH CET 2019 has changed from offline (written) mode to the online (computer based) mode. The notice regarding the proposed change in the mode of MHT CET can be read HERE. The Syllabus and Marking Scheme of Proposed Online MHT-CET-2019 were published on 14th November. CLICK HERE to check. The Government of Maharashtra has established “ADMISSIONS REGULATING AUTHORITY AND STATE COMMON ENTRANCE TEST CELL” as per the provisions of the Maharashtra Unaided Private Professional Educational Institutions (Regulation of Admissions & Fees) Act. 2015 (Mah. Act No. XXVIII of 2015). The Commissioner of State CET Cell, has been designated as Competent Authority for conducting MHT CET 2019 and selection of candidates for admission to First Year of 4 Year Duration Full Time Under Graduate Degree courses in Engineering and Technology, Pharmacy and First Year of six Year Duration Full Time Under Graduate Degree course in Pharm D for the academic year 2019-2020. In exercise of the powers conferred by section 23 of the Maharashtra Unaided Private Professional Educational Institutions (Regulation of Admissions and Fees) Act, 2015 (Mah. XXVIII of 2015), the Government of Maharashtra has notified the rules to regulate the admissions to the First and Direct Second Year of Full Time Professional Undergraduate Technical Courses (Engineering and Technology, Pharmacy, Pharm D., Architecture, Hotel Management and Catering Technology). These rules are called the Maharashtra Unaided Private Professional Educational Institutions (Regulation of Admissions to the Full-Time Professional Undergraduate Technical Courses) Rules, 2017. The admissions shall be carried out as per these Rules and its amendment from time to time. These rules are also applicable for admissions in Government and Government Aided professional educational institutions including ICT, Mumbai as per Government Resolution TEM-2016/C.R.473/16/ TE-4 dated 25th April 2017. The role of the Directorate is to maintain, enhance the standard, quality of technical education by laying the policies, establishing developing Govt. Institutions, guiding supervising the aided, private institutions, interacting with industry and national level institutions, coordinating with other departments of State Government, Government of India Statutory Organisations and to contribute to the development of industry society at large. The approximate number of questions based on the 11th standard will be 10 and 40 from class 12. The questions will be application based. The MHT CET 2019 that was earlier conducted in an offline mode is now going to be held in the online computer based mode. Candidates can access the MHT CET Mock Test 2019 link that has been made available to understand the working of MHT CET online exam. If you are an appearing candidate of MHT CET 2019, you must mark all the exam events along with their dates on the calendar! Candidates are advised to keep track of the updates for the release of final dates. Age Limit: There is no age bar for appearing in the MHT CET 2019. Qualification: The candidate must have passed or must be appearing in HSC/ 12th standard Board examination or its equivalent examination. Other State Candidature Candidates with domicile from other states than Maharashtra. NOTE: Please note that it is necessary to take the MHT CET for admission into Agricultural Courses offered in the affiliating institutes of MH CET. JEE/ NEET/ AIEEA-UG will also be considered equivalent to MH CET for admissions. Qualification Marks: The candidate must have secured 50% aggregate marks (40% for SC/ST/VJA/NTB/NTC/NTD/OBC/SBC category) in the qualifying examinations. Disability Certification: The candidate belonging to PwD (person with Disability) must produce a legal certification stating that the disability is at least 40% and of permanent nature. For detailed information about the Qualifying marks in each subject and course, Check the table below! Note: Preference will be given to the J&K Migrant candidates with JEE Mains 2019 Score over MHT CET 2019. It is necessary to take MH-CET for admissions into Engineering, B.Pharm./ Pharm.D courses in Maharashtra. DTE Maharashtra has released the MHT CET 2019 Application form on 1st January and will be available till 31st March 2019. You will be able to fill up the application form in the online mode on the official website which is dtemaharashtra.gov.in. One must be careful while filling up the application form and entering only the correct details. MHT CET 2019 application form filling procedure will include steps like registration, uploading scanned images and paying the application fee. The information brochure for MHTCET 2019 is available on website www.dtemaharashtra.gov.in/mhtcet2019. The Candidates are advised to download and print the brochure. For submission of online application form, the candidates should login at www.dtemaharashtra.gov.in/mhtcet2019 website. The detailed procedure for online submission of application form & registration is as follows. A candidate has to first register for MHT CET 2019 at dtemaharashtra.gov.in/mhtcet2019 and only then he /she can make the payment online. MHT CET 2019 Registration: In order to register online, the candidate has to visit the website http://www.dtemaharashtra.gov.in/mhtcet2019 and click ”Apply Online”; The MHT CET 2019 Registration page opens up wherein he/she has to fill-in the online form. The information to be provided includes personal details and uploading of your recent color passport photograph and signature. Filling of Online Application form: The candidate will be prompted to enter valid personal email id, personal mobile No. and a password along with other required information while filling the online form. Remember the password set. Use this password during the application form filling. An email and SMS will be sent to this registered email id and mobile no. Please quote your Application no. in all future correspondence with MHT- CET Office. To Upload Photograph and Signature: Please note that all the applicants are required to upload their recent scanned/digital colour photograph and signature. The file size of the Photograph should be between 15 KB to 50 KB and Signature should be between 5KB to 20 KB per file. The online application system will not allow uploading files smaller or larger than the specified size. All Candidates have to upload their Photograph and Signature in “.jpg” format only and file name of Photograph and signature should preferably be photo.jpg and sign.jpg respectively. Take your recent colour passport size photograph. The picture should be taken against a light/white background. In case the face on the photograph is not clear, your application is liable to be rejected. Candidate should upload such scanned/digital recent colour photograph. The candidate himself/herself should sign (no capital letters) on a white paper with a black ink pen. Once photograph and signature files are uploaded by the candidate successfully, the system will show on the screen Photograph and Signature that has been uploaded. If these have been correctly uploaded, you should now proceed further to make the online payment. MHT CET 2019 Application Fee Payment: Application form processing fees as stated in the table given below is to be paid through online system only by Internet Payment, Credit Card/ Debit Card (RuPay/ Visa/ MasterCard/ Maestro), Internet Banking, IMPS, Cash Cards, etc for which the service charges, as per rules, shall be applicable in addition to the application form processing fees. No other mode of payment shall be permitted. This fee is non-refundable and non-transferable under any circumstances. Registration Process Completion: On successful payment of the application fee, a confirmation of the same will be displayed online. Candidates shall print the receipt for future references. After successful payment, Candidate shall take the print out of MHT-CET 2018 Registration Confirmation. 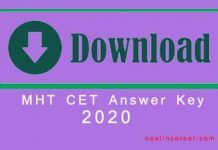 Keep a copy of MHT CET 2019 Application No. & Password: The candidate shall keep a copy of MHT CET 2019 Registration Confirmation printout. Please quote the MHTCET 2019 Application No. in all future correspondence. Are you struggling with a question on your mind? If yes, then ask us in the comment section below to get a quick answer to your problem. If you are starting with the preparation of MHT CET 2019, then this is the correct section for you. You must start by checking the official brochure of MHCET 2019 which contains the exam pattern and syllabus incorporated as follows. Candidates must check the pattern given here for the better preparation of the examination. Have a look at the MHT CET 2019 exam pattern below. Exam Type: MHT CET 2019 will be held in the Online mode now. Time Duration: Candidates will have a total of 90 minutes to take the examination. Question Type: Once the question paper is in your hands, you will see Multiple Choice Questions on it. Languages – The MHT CET 2019 question paper will be in English, Marathi and Urdu. Sections: There will be 3 sections in the exam, with each section/paper carrying 100 marks. Number of Papers – There will be 3 papers i.e. Paper 1 – Mathematics and Paper 2 – Physics and Chemistry and Paper 3 – Biology. Pharmacy students have to appear for Paper 2 and can choose between Paper 1 or 3. Marks: Questions in Paper 1 will be marked out of 2 marks each while questions asked in Paper 2 and Paper 3 will be marked out 1 marks each. There is no provision for negative marking. Once you have checked the full exam pattern, your next step should be to check the MHT CET 2019 syllabus. 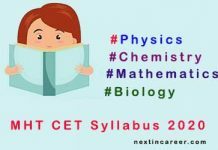 The Syllabus of MH CET 2019 contain topics from Physics, chemistry, and mathematics that the candidate has studied at 10+2 level. If you still haven’t noted down the full MHT CET syllabus, check it HERE. Mark these important points about the MHT CET 2019 admit card on your mind! If you have filled and submitted the application form correctly, you will able to download the MHT CET 2019 admit card. The Admit Card is an essential document that the candidate must carry to enter the exam hall to take the entrance exam. The MHT CET Admit Card 2019 will be available from 25th April 2019 To 2nd May 2019. It will be available on the official website for candidates to download. Candidates must check all details and download the Admit Card. Candidate should take 2-3 printouts of the Admit Card for future reference. We see you have a question on your mind. Don’t hesitate to ask us in the comments section below. The exam may be conducted online or offline. 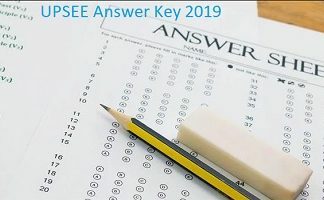 If exam is held in offline mode, the exam conducting body will be releasing the MHT CET 2019 answer key. The answer key will contain all correct answer codes to questions asked in the examination. Candidates can download the answer key and cross check their answers. DTE, Maharashtra will be releasing a provisional answer key first and then the final answer key. If you are among those students who are not satisfied with the answer key, then you can challenge the provisional answer key. Please note that candidates will be able to submit their objections against the question papers from 15th May to 18th May 2019. Soon after the exam has been conducted, DTE Maharashtra will declare the result for MHT CET 2019 on or before 3rd June 2019. 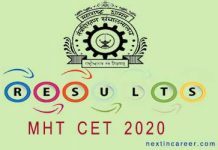 The MHT CET result 2019 will be published on the official website and will be provided here as well. DTE will be publishing the answer keys first for all the respective question papers as per the schedule. Those who have taken the exam can also check the OMR sheets that will be uploaded on the official website. Through MHT CET 2019 results, candidates will be able to check their marks and analyze their performance. The Directorate of Technical Education, Maharashtra will release a merit list after the exam has been conducted. The MHT CET 2019 Merit list will be published in the 3rd week of June 2019. The exam conducting body will publish the merit list based on the performance of the candidate. First, a provisional merit list will be released against which candidates will be able to file grievances (if any). In a few days, the final merit list will be released and eligible candidates will be called for counselling on the basis of final merit list. The cut off is the minimum qualifying marks that the candidate must obtain in order to qualify the examination. MHT CET 2019 cutoff will be released after the results have been announced. In order to be eligible for admission to various institutes affiliated to MHT CET 2019, candidates must obtain the cut-off. There will be separate cut-offs released by each institute and candidates must meet the cut off to be listed in the merit list. The MHT CET 2019 counselling will commence from the 1st week of June 2019. The eligible and qualified candidates will be invited for the counselling. MHT CET counselling will be held through Central Admission Process (CAP) in three rounds. If need be, there will be an extra CAP round called the spot round. Seat allotment for all candidates will be done on the basis of the merit list released. Candidates with a higher rank will be given more preference than those with a lower rank. It is necessary for the candidate to read the information brochure before filling the application form. The candidate must have fulfilled all the eligibility criteria. The instructions and specifications as provided are mandatory to abide by for the successful submission of the application and getting a candidature of MHT-CET 2019. PwD candidates who require scribe must fill in the declaration given at the end of information brochure. All the important contact details are also provided in the information brochure, candidate in need to contact the authorities may contact the concerned representative. If you have any queries, let us know in the comment section below! Next articleMHT CET 2019 Application Form Released – Last Date to Apply!! There is no information regarding application form correction in the official notification. If DTE will provide some information regarding the same then we will update on this page. You can send a mail to the concerned authorities regarding the same or call on the Helpline Number – 022-49150801. Hi.. To have Domicility in Maharashtra, how many years should hv a student been here..? Any other rules? Pl inform..
Mam i make mistake in my application form not mention my cast certificate then now what We do mam?? Mam i make mistake in the form not mention my cast cerificate then now what we do mam??? Sir. Mht cet is needed for d.pharmacy course??? Sample paper of MHT CET are available hi kay , Like jee nta give sample paper online. There are no sample papers for MHT CET 2019 released officially. You can check the sample papers that are available online. Yes, you can cancel your application and fill it again but you will be required to pay the fee again. I am from Delhi . How can I ensure that my form has been submitted successfully? Sir,l choose physics, chemistry, maths and also bio.l have correct form. In my non-creamalayer certificate ,they write issue date not a valid date, they, wrong? Please say sir. Sir, I choose chemistry, physics, maths and also biology.l have correct form. Yes you can cancel the form and submit it again. But you will have to pay the fee again. I have chooses my category as open in MHTCET application form instead of choosing SEBC . Can I able to correct my mistake. Hi, since there is no application form correction, it is less likely that you can correct the information in the application form. You can send a mail to the concerned authorities regarding the same or call on the Helpline Number – 022-49150801. If MHT-CET application photo attached horizontally and make payment and submitted the form …Then CET cell can Reject this form? I submitted my application form with fees and now I want to make changes in subject can i do change?if yes then how ? Hi, since there is no mention about the MHT CET 2019 Application form correction, it is less likely that you will be able to make changes in the submitted application form. We will inform you if it is made available. I have not applied for non creamy layer certificate . Is the certificate necessary for filling up the for of the exam? Hi, if you belong to the non-creamy layer, you must produce the NCL certificate at the time of document verification. Otherwise, it is not necessary. I had only PCB,So can I give MH-CET without maths..plz help me to getting out from this confusion. Yes, you can either apply for PCB or PCM. Hi, if you haven’t submitted the form you can still edit it. If you have submitted the form then you can cancel the form and submit it again with the new fee. Yes, you can apply for admission through JEE Mains 2019 score and need not take the MHT CET 2019. The MHT CET 2019 will be conducted for engineering, pharmacy and agriculture courses. Admissions to affiliated colleges of Maharashtra can only be done for courses that are mentioned in the information brochure. Since Bachelors in Physiotherapy is not offered by any of these colleges, you cannot apply for it under MHT CET 2019. To take admission in colleges where Bachelors in Physiotherapy is offered, you will be required to take the JIPMER entrance exam. No, candidates who haven’t taken class 12th exam or are not taking class 12th exam in 2019 cannot take MHT CET 2019. Is HSC result percentage neccesary for admission in clg or MHTCET percentage? HSC and MHT CET percentage both are necessary for admission. Hi please check this article to know the correct way to take the mock test. CLICK HERE TO READ. My self have cancelled my admission Fe pharmacyat facilitation center itself in the year of 2018 also documents regarding my bank account submitted at the center itself .But till date the refund is not deposited .Pl tell whom to contact. Hello, we cannot help you regarding the refund. You must contact the official authority for the same purpose. Hi, yes you can apply for MHT CET 2019 but under the “ALL INDIA CATEGORY” candidate. Please tell us the category and the course for which you are applying so that we can tell you the qualifying percentage of 12th. I am living in Pune since 2002. My son is born in Jamshedpur in 2002. All his schooling is in Pune. We do not have Maharashtra domicile. Can he get admission at COEP through MHTCET exam? Hello, since you do not have a domicile of Maharashtra, your son will fall under ALL INDIA CANDIDATURE. He can appear for MHT CET but to take admission in COEP, he will be required to obtain the cutoff marks released by the institute after the examination has been held. Sir, i want to take admission in B.sc(Agri)after giving mhtcet( this year ), so which grp should I select for that in MHT-CET examination ,either PCB or PCM or both i.e.PCMB ? The admission to B. Sc Agriculture cannot be made through MHT CET. Hi, till now there is no information regarding the facility for correction in the application form. There is likely any chance that the correction can be made. According to the official brochure, you can cancel the form and fill another one. However, the fee has to be paid again and the previous fee will not be refunded. Sir, I am in OBC category. To fill this form whether non creamy layer certificate is mandatory? and Non-Creamy Layer Certificate if applicable at the Time of filling in CAP Application Form to be considered under Category. Sir i have fill the form but the date of the non creamiliar is filled by mistake incorrect then what i should do now ? No Application form Correction for MHT CET. You can re-submit your application form with a new one. There is no application form correction but you can re-submit your application form with a new one. The candidate will be permitted to submit his/her application only once. If the candidate wishes to submit his/her application once again, then he/she should cancel his/her previous application before filling the new application. The process of cancellation of the filled application is available in the user manual for filling up the online application form. Also, In any case, the candidate has canceled his/her application, the fees paid for the same will not be refunded under any circumstances. Does your application have a field where it is asking for Caste validity number? Because according to the brochure, you will have to submit details of caste validity during the CAP round only, which will be released after April only. The 3 year Law CET 2019 application form has not been released till now. for submission of Application Form for CAP. Sir… Can i fill the same application form again after cancelling the first ?? Please reply to my ques its very important for me..
Is there any corrections facility for mhcet application form ?? Sir.. Can the application be recorrect after filiing it?? There is no information mentioned about the application form correction in the MHT CET 2019 brochure, so there is no chance that there will be any application form correction facility. What should I write in the surname column if I don’t have a surname? If you have no surname please blank the column. this column is not mandatory in MHT CET Application Form. Bvsc or AH ka Admission MHT CET Se Nahi hoga. BVSC Admission through NEET exam. No negative marking in MHT CET exam. Hi Priyanka MHT CET Application form is available. Get the MHT CET Form here. Click Here to check the form. Non adhar registration are allowed? YES, the registration without Aadhaar card is also allowed.